Just to repeat myself, I will say that I am very much enamored with calla lilies. 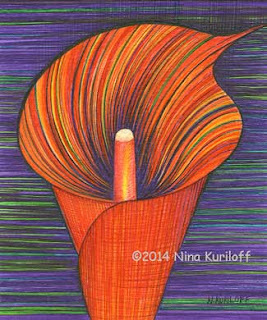 In this rendition, I spent a lot of time working on the center of the calla. This piece was created using a variety of pens on paper, and it measures approximately 7 x 6 inches. I have this piece for sale on Etsy, as well as Ebay. Here is a link to my listing of this drawing on Etsy.